Wells Fargo & Company is an international banking and financial services company with more than 70 million customers across 8,700+ locations. 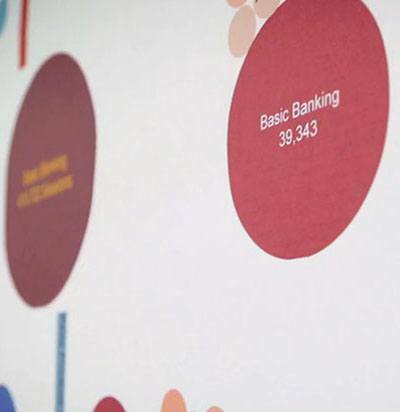 With Tableau, Wells Fargo’s customer insights team took what they called messy, “gobblygoop”, disparate data and turned it into sound insights that drove strategy around the redesign of their business banking portal. Now, with Tableau, the team achieves more results with less team resources, propelling them to make business decisions faster. It all started when Wells Fargo needed to understand user behaviors on their previous banking portal. The team dug into data for answers that would help them optimize their redesign. They had plenty of data from their highly diverse customer base, but “quickly found out this data was a complete mess,” said Brian Mooneyham, VP, Customer Insights & Analytics. They soon realized they needed more mindshare to sort through all this data to find meaning and make impact. But rather than expanding the team just for this project, they turned to Tableau, which kept the team nimble and able to make complex decisions fast—without the guesswork. They were able to focus on analyzing data that told the collective story of their customers, and ultimately achieved desired results for their new banking portal. Now a lot of our resources in our very small team are focused on turning data analytics into insights. I wouldn’t want to do my job without Tableau. I can absolutely say that. It has done a lot of great things for my role and the role of my group.